That last question is one that historians working on the early modern period rarely have to grapple with – after all, the individuals who wrote the letters, manuscripts, and account books that we read have been dead for a very long time. And, it is an issue that I’ve blithely ignored until I read Manuel Gonzalez Pallano Tinoco’s “Narrative of the Invasion of La Española, Santo Domingo, which the English Attempted in 1655.” It is near the end of Captain Tinoco’s detailed description of the failed English invasion of Spanish Santo Domingo that this long-deceased chronicler called out future historians who would use his narrative on any but his own terms. And, his reasoning was compelling enough to make me question my own methodology in using his history in my work. First a little background. In late winter of 1654, Lord Protector Oliver Cromwell dispatched Admiral William Penn and General Robert Venables to the Caribbean with orders to attack islands held by Spain. This massive invasion force became known as Cromwell’s “Western Design,” through which Cromwell envisioned establishing military staging grounds for a fuller invasion of the Spanish American mainland. 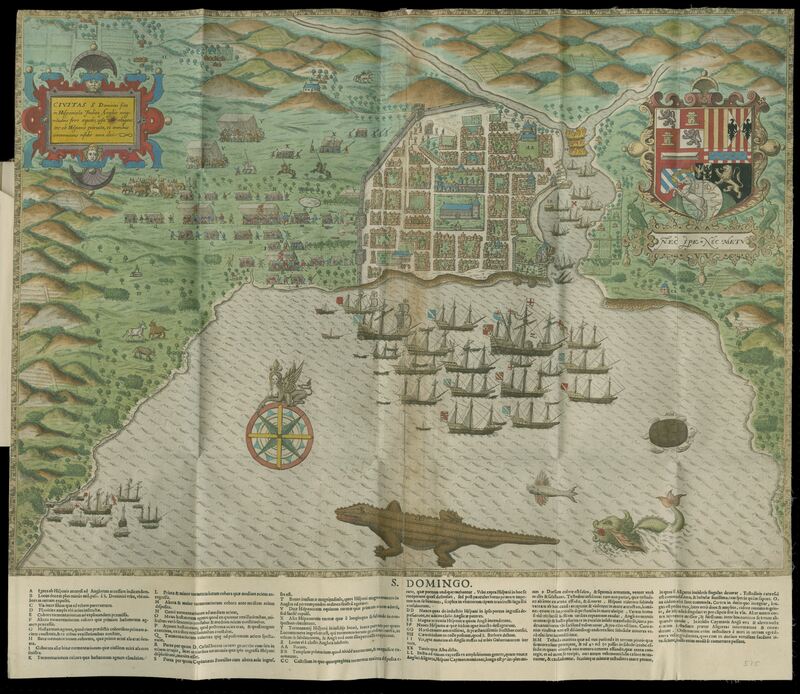 In the end, Cromwell’s dreams of becoming the master of Spain’s American wealth were dashed by poor planning, a virulent disease environment, and a spirited defense of Santo Domingo on the part of the island’s residents. Turned away from La Española, Penn and Venables salvaged the surviving Englishmen under their command and took the lightly populated island of Jamaica. It is in the context of the English seizure of Jamaica that Cromwell’s Western Design usually appears in historical narratives, with the initial attempt on Santo Domingo only peripherally important. Historical moments such as Cromwell’s Western Design are useful for my research on seventeenth-century Caribbean slavery – not because I write about warfare per se, but because inter-imperial conflicts produced documents. And, in my attempt to reconstruct the lives of Europeans and enslaved Africans, I am willing to look through any and all extant materials. It was in this spirit that I gravitated to Captain Tinoco’s description of the invasion, noting moments when he discussed enslaved and free people of African descent fighting among or against Spanish soldiers and paying less attention to the narrative of the actual fighting. Whoa. While it might not seem like an earth-shaking conclusion to some, those parting words seemed aimed right at me. Charged with “reading against the grain,” I had dissected Captain Tinoco’s narrative for what it could tell me about seventeenth-century Santo Domingo’s race relations. It had never occurred to me until the end that I was also reading about Captain Tinoco’s “friends and comrades,” some who died fighting close quarter combat with lances against a terrifyingly large invasion force. Somehow, I’d overlooked a part of the narrative where Captain Tinoco described the dead bodies surrounding the city walls, which he explained, “to count them was impossible, because they stunk, and because they were heaped up on each other in piles of 40 and 50 corpses” (30). I’d even missed his account of a soldier on sentinel duty who fired shots in the night and raised the alarm in the besieged city of La Española. Turns out, the soldier was spooked by the figure of a horse and, as Captain Tinoco wrote, “this man had the phantasm of fear in his heart, and the fighting he should have done in reality, he did in his dreams” (31). Manuel Gonzalez Pallano Tinoco, “Narrative of the Invasion of La Española,” in I.A. Wright, ed., Spanish Narratives of the English Attack on Santo Domingo, 1655 (London, 1926): 38. Count de Peñalva, don Bernardino de Meneses Bracamonte y Zapata, Captain Damian del Castillo Vaca, Captain don Alvaro Garabito de Aguilar, don Joseph Gutierre de Meneses y Luna, don Pedro Pimentel, Sargent Mayor Lucas de Verroa, Captain Juan de Lugo, don Andres Medrano, Sargent Diego Rodriguez Tirado, Captain don Miguel de Villafaña, Captain Esteban Liranso, Lieutenant Joseph de Alvarez, Captain don Lope Lopez de Morla, Captain Lazaro Franco, don Juan de Mieses, don Diego de Arse, Bernardo Luis Caraballo, Captain Pedro Velez Mantilla, don Fernando de Moronta y Fuenmayor, Antonio Hernandez de Cuellar, don Alonso Estevez de Figueroa, don Garcia de Guzman, Captain Antonio Barroso, don Pedro de Castro, Captain don Juan de la Vega Torralba, Captain Melchor Nuñez, Juan Gomez Ochoa, Father Juan Romero, Thomas Gillen, Father Juan Berrosano, Captain don Fernando de Moronta, Francisco Hernandez, Gonzalo Fragoso, Juan Esteban Maldonado, Captain Juan Morfa Geraldino, Captain don Rodrigo Pimentel, don Diego Franco de Cuero, don Rodrigo de la Bastida y Peñalosa, don Francisco de Paredes Carreño, don Geronimo de Aliaga, Captain Francisco Bueno, Captain Francisco Vicente Duran, Captain don Balthazar Figueroa, Captain Gabriel de Rojas, Captain Francisco Cerezo, Francisco del Hoyo, and Captain don Antonio Ortiz de Sandoval. « Have Cultural Historians Lost the American Revolution? As someone with an interest in history (but not a historian), I often wondered how much was scrubbed out of original material in order to form a more-concise narrative. Thanks for this piece, and for Captain Tinoco for being prescient in his admonition. Thank you for the comment. Yes, deciding what to highlight and what to leave out when constructing a historical narrative is one of the hardest parts. Of course, it makes sense to focus on parts of primary sources that speak to your argument, but there are costs to that. Maybe the key is in being upfront about choices being made? I’m not sure. I also use military documents for reasons often divorced from military history, and have encountered similar moments when a random detail really makes me pause and think. I continue to find the details challenging when I sit down to write: how much do you put in and what do you leave out–especially the stuff that’s not directly related to your argument? To some extent I want to set the stage and provide background, but I’m also aware that few people will want to read a 500-page book or 15,000-word article. No solutions here. Just shouting solidarity into the scholarly void! Thanks Rachel! It’s funny, because it’s not as if I disagree with reading sources against the grain to get at voices that are often difficult to access (i.e. enslaved people). But I was struck by how “modern” Tinoco’s descriptions were. There was something troubling about realizing that I’d “skimmed” those relatively horrible details. And, I totally agree with you, those choices need to be made to avoid writing works that are too long. I suppose it was just a little unnerving to be called out by a source for ignoring what he thought was important about his account. Very nice article. It reminds me of the ending to Le Morte D’Arthur, (1485) by Thomas Malory, ” I pray you all, gentlemen and gentlewomen that readeth this book of Arthur and his knights…pray for me while I am alive, that God send me good deliverance, and when I am dead, I pray you all pray for my soul .” And a few sentences later, the printer, William Caxton, added this: finished at the abbey, Westminster, the last day of July the year of our Lord mcccclxxxv.” I can picture Caxton himself working on his press at a building that still exists more than five hundred years later. And how many people have actually prayed for Malory’s soul in the centuries since? Probably a lot! Thanks, Casey – I appreciate the compassion you’re bringing to your scholarship. Perhaps you are not using Captain Tinoco’s narrative on his terms, but your work is reintegrating the names and experiences of those enslaved persons whose names have been ‘erased from memory.’ So, yes, let’s not overlook the humanity of those named in our documents on the way to an argument, but let’s also continue to recover the stories of those who rarely made it into the documents in the first place. I couldn’t agree more, Keith. The job of bringing to light the experiences of the people Captain Tinoco doesn’t name justifies my use of his narrative on my terms, not his.